I’ve never been a carrot lover until recently, so I had to experiment with carrot recipes to find one I truly liked. I make these carrots about once a week at work and customers line up for them. Even people that don’t like carrots will eat these. I’ve got a faithful following for this “easy to make” side dish. My mom’s dogs beg for them and her exotic “talking” birds say “YUM” when given a carrot or two. 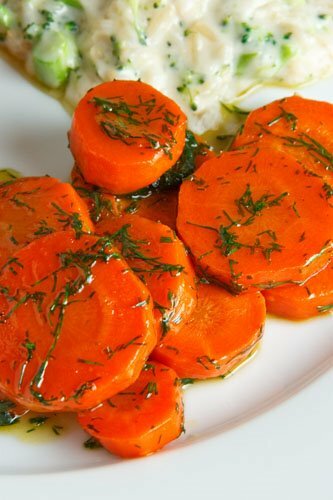 These are a perfect side dish for a party or holiday meal and this recipe is a good way to get even a finicky child to eat their carrots. Cook the carrots by steaming or boiling until fork tender, being careful not to overcook. They need to hold their shape. Drain and arrange in a single layer in a baking or casserole dish. Top carrots with brown sugar first, then butter, orange juice and dill. Bake in 350F oven for 20-30 minutes, stirring about halfway through, until “sauce” has begun to thicken around the carrots. Make sure you don’t brown the carrots or let them dry out. You may want to stir them more than once. This entry was posted in Vegetable Side and tagged dill, glazed carrots, holiday side, orange glazed, party side, roasted carrots by quarlj01. Bookmark the permalink.